When the sun’s out and the air - warm, every red-blooded Australian male feels an unstoppable pull towards their grill. We want to get our friends and family together and cook something delicious - and that’s a feeling we love and admire. But one thing we don’t like? The tools we see near and around most Australian barbecues - for they are sorely lacking. See, we’re used to the cheap, low-quality tools that come with grill sets. These pieces get the job done, but are neither high-quality nor well designed - which reflects poorly on the quality of your food. In some cases, plastic tools can even contaminate what you’re cooking - something you do not want to happen. Besides, few things are as bad as cutting a $30 filet mignon with Mickey Mouse utensils. When it comes to grilling, the devil is in the details - and your BBQ accessories, from knives to carrier bags, will determine the quality of your end experience. So today, we’ll tell you all about our product range and what distinguishes top-notch accessories, tools and utensils, whether you’re looking for mens’ gift ideas or a present for yourself. After all, Man Law BBQ is one of the world’s premium BBQ companies - so you can trust us to know a thing or two about grilling the right way! It’s the tools that make the grill - and the bad boys here at Man Law BBQ all come in heavy-duty, extra-thick stainless steel and do not mess around. They can take any challenge you throw at them - and, we’re pretty sure, can be accessories to a crime. Our tools come with premium wood handles by default, but you can also go high-tech with, say, a set of tongs with a digital thermometer built into the handle. How’s that for a fancy mens’ gift? Anyway, enough about us - let’s talk about what to look for in tools you want - and the 3 important tool categories you need to know. First up are the tongs. This is perhaps the most important tool of all because it has so many uses. You can use them to direct raw meat, chicken and fish from its packaging and onto a plate - or directly onto the grill. You can also hold your food items with tongs if you want to wash them before placing them on the grill. Then, of course, you can use tongs to flip whatever you’re grilling over in absence of a spatula - and, if you give them a good wash, transfer the same onto a plate. What’s important in tongs is the quality of construction. You don’t want them to lose their bounce-back or tear apart, so it’s better to pay a few dollars more and get a quality product. As you’ve probably guessed, our tongs are made with stainless steel and a variety of top-notch handle materials, from rosewood to serrated heavy duty steel. As if that wasn’t cool enough, we also feature foldable tongs - including ones with a built-in thermometer. Here at Man Law, we put your barbecuing needs first so it’s crucial to us that our BBQ utensils serve all your needs. Next up is the spatula. While not quite as versatile as a set of tongs, a spatula can still make or break your barbecue - and, if picked poorly, ruin your grill surface. That’s why you don’t want it to be too hard… Or so soft that it bends or, even worse, melts when exposed to heat. We solved this problem by making our spatulas from top-grade stainless steel that won’t scratch your grill - but that’s still heat-resistant enough to withstand any fire you might get going in your backyard. Last, but certainly not least, is the Fork. As with a spatula, your fork shouldn’t scratch your grill while being sharp enough to skewer whatever you’ve got cooking. Like the rest of our tools, they're made from heavy-duty gauge stainless steel, and designed to take a beating without giving your grill surface one. The question is, which of our sets - or standalone pieces - should you get? If you’re looking to gift someone a wonderful BBQ toolset, you can’t go wrong with the beautiful hardwood set or the pure stainless steel trio. The first looks beautiful, whereas the second is as practical as you can get - and both come with wonderful designs and extra-long handles that keep whoever’s using them safe. Mens’ gift ideas can be hard to come by, but these are sure to be a hit - believe us! If you’re looking for a less fancy option, check out our non-slip designs. They’re practical, they look great, and the dimpled handles are perfect for safety! Finally, if you enjoy camping, hiking and the great outdoors, you can’t go wrong with the foldable bbq utensils. They’re easy to clean and transport, even if you’ve only got a small bag - and come with lovely rosewood handles for an extra touch of class. Next up, we’ve got BBQ accessories and gadgets, which we make in all kinds of shapes, sizes and design styles. A perfectly grilled steak cut is one of the world’s greatest wonders. But like any great thing worth having, it doesn’t just happen by itself. No: you’ve got to have the right tools, know how to use them and make sure that your meat is in the right place, at the right time, at the right temperature. So get ready to go 007 on your next BBQ with fancy grill gadgets, like the ones you can buy at our online store. On our website we have a full range of grill baskets that’ll keep your corn, fish, meat and seafood from falling into the coal - and keep your hands protected with extra-length handles. Things can get hot and heavy when you’re grilling, and even if you do your best to stay safe, it’s still easy to burn yourself in the heat of the moment. It happens to everyone - but once you get a pair of Man-Law gloves on your hands, you’ll never have to feel the burn of a BBQ gone wrong again. Another thing you won’t have to do in the future is cook in the dark again. Let me paint you a picture to illustrate what I mean. The daylight’s gone. You already set your mind on having a barbecue - so you’re not going to be stopped. Unfortunately, there’s absolutely no outdoor lighting… All you’ve got is a faraway street lamp that barely reaches your front door, let alone your backyard. Your first option is to call it off, put the beer back in the fridge and tell your friends and family BBQ night is off. That means dealing with everyone’s disappointment and going to bed with a belly that has absolutely no grilled meat in it. Option #2 is to put the beer back in one hand, tongs in the other and go to work… Which may be fun, but a good BBQ it does not make. 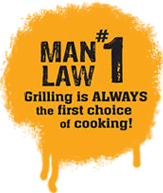 Fortunately, there is a better way…The man-law BBQ grill light! This bad boy is portable, and easily clamps to the side of a table or a grill set-up. You can use it to keep grillin’ no matter the time - and enjoy your spoils under this swanky BBQ light immediately after. It’s convenient, it’s versatile, and at just $40, this barbecue grill light is a must-have; no more, no less. At this point, you’re probably wondering… Where are you going to put your set of knives - and how are you going to clean all your tools once you’re done with your midnight cookout?! Yes, grease and oils do get rancid, especially when it’s hot out - so you want to clean everything, from the grill itself to the tools, as soon as possible. Unfortunately, this takes away from the fun of BBQing… But guess what? It doesn’t have to. Our BBQ brushes come with stainless steel bristles that’ll get that old grease off in a jiffy, and a heavy-duty 2mm scraper that’ll get larger bits and pieces off instantly. There’s even a built-in bottle to make sure the chef stays hydrated! Just don’t forget to clean the grates; too many people overlook this moment, but dirty grates are the primary reason for soot-covered meat… Which is something you want to avoid. And, of course, don’t forget the last-but-not-least category of cooking meat to perfection: devices that measure (and help you control) temperature! If you’re still using your grandpa’s roast thermometer, or whatever piece of junk device your grill manufacturer threw into the box as an afterthought, we’ve got bad news… Your chances of cooking the perfect steak are close to nil. And if you don’t have a thermometer at all, heaven forbid, then we’re really worried for you. Waving your hand over coals and poking steaks with a knife to gauge their readiness means you’re wasting money, because you’re not getting anything near your meat and seafood’s full potential. Even worse - if you don’t have a BBQ thermometer, there’s no way to know that your chicken or fish has cooked properly, meaning you could be risking your family’s health! Let’s be honest. It’s 2016 - and with great digital thermometers being so cheap, and regular ones - so well-assembled and accurate, there’s no reason not to have one. It’s the only way to guarantee your food is really done and safe to eat - each and every time. Let’s look at the main thermometer types we have on offer here at the Man-Law store - and explain what makes each kind different. A digital roast thermometer will give you its most accurate reading in 5-15 seconds. It’s not literally instant, but it’s also faster than analog - and you can use our meat thermometers for grilling as well as home cooking. They’re versatile, inexpensive and - wait for it - some of them programmed to understand meat. In fact, our insta-read gauge knows seven kinds of it - and will help you make sure your steak’s rare, medium, well-done or anything in-between. You can also program these digital gauges to do stuff like alert you when a certain temperature is reached, taking all the guesswork out of the equation. If you want to take your grilling skills to the next level, you need one of these - pronto! Digital thermometers are all the rage today - but what if you like to keep things old school? Then you’ll love our analog options that don’t need batteries to operate - and almost all of which glow in the dark. The Man-Law analog thermometer range comes with stainless steel construction, easy-to-read dials, dishwasher-safe builds. Even better, one of the gadgets in our range does something very unique: it measures the grill’s surface temperature. That means you can avoid burning your meat on a grill that’s too hot, or dropping it on one that’s just warming up. Between the surface temperature thermometer and the rest of our analogue range, you’re sure to find everything you need to cook your meat to perfection. How’s this for technology? Now, you can get the temperature of your steak, accurate to 0.2 C, while standing a foot or two away from the grill and enjoying a cold one. That means you don’t have to risk burning yourself while trying to get a thermometer in or out of your meet - or keep running over to your barbie station to make sure the temperature’s still right. But what really makes this a no-brainer is how cool it looks when used. With a backlit display and the ability to measure a 1-cm spot from 5 inches away, you won’t just get detailed information about the temperature in each and every spot - you’ll look awesome holding this futuristic tool, too. You’ve made it this far, which means you and the Man Law team has one important thing in common: we both love and appreciate well-cooked meat! To recap, there are 3 things you need, all of which are for sale here: thermometers, a full set of grilling accessories, and the auxiliary tools you need: lights, gloves and bags. Once you have all of these, the only thing that can stop you from cooking a perfect grill is running out of meat. So long as you nip this issue in the bud by doing your shopping in advance, everything you could need and want for your cooking pleasure is available at our store. Happy shopping!